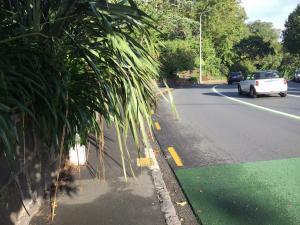 The growth of the flax bush obstructs the footpath, and forces pedestrians to step into the path of oncoming traffic. Someone will get collected by a bus one day soon. in case the link to the map fails, this is on Remuera Road on the city side from Market Road, between Market Road and the entrance to the Mount Hobson domain.